Valencia Basket Club makes history! 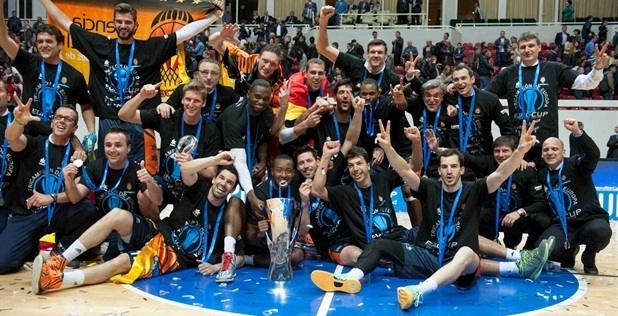 The 2013-14 Eurocup season is in the books, and Valencia Basket Club has become the first three-time champion in the history of the competition. Valencia never trailed at any point of either finals game, sweeping the two-game, home-and-away Eurocup Finals series, and with an aggregate score 140-165, won the trophy it previously raised in 2003 and 2010. As the 2014 Eurocup champion, Valencia also earned a pass into the Turkish Airlines Euroleague next season. This was the first time since the inaugural 2002-03 ULEB Cup season that the competition's winner was decided in a two-game series. Valencia Basket Club never trailed in beating Unics Kazan 73-85 in Game 2 of their two-game finals series, and winning the series with an aggregate score 140-165. Valencia dominated behind another brilliant performance from Eurocup Finals MVP Justin Doellman, who finished the return leg with 26 points, 5 assists and tied a Eurocup Finals record with 4 steals. Valencia played it to perfection on defense early on, limiting Unics to a Eurocup finals record 4 points in the first quarter. After leading 4-16 in the opening 10 minutes, a pair of three-pointers from each Pablo Aguilar and Rafa Martinez on four consecutive trips down the floor extended the difference to 10-29 in the second quarter, which translated into 32-point series advantage. Unics never came closer than 12 points the rest of the way. Martinez netted 14 points, Van Rossom scored 11, and Romain Sato collected 9 points and 7 rebounds for Valencia in victory. Eurocup MVP Andrew Goudelock scored 22 points for Unics, Ian Vougioukas had 11, while Chuck Eidson collected 8 points, 8 rebounds and 4 assists. The Eurocup title is up for grabs after Game 1 of the finals in which Valencia Basket Club downed Unics Kazan 80-67. Valencia led from start to finish, and took the upper hand in the two-game Eurocup Finals series behind Justin Doellman’s 28 points, but it was Unics which finished the game strong, with a 2-18 run to end the game. After leading Unics Kazan to the best record in the Eurocup, 20-2, behind the best defense in competition history, head coach Andrea Trinchieri talks about the final that starts Wednesday in Valencia, Spain, saying he wants his players to enjoy themselves. One the eve of the Eurocup Finals, meet Velimir Perasovic, the man who won three Euroleague titles as a player aims to make Valencia Basket Club the first three-time Eurocup champion as a coach: "There is no room for many mistakes." At the start of the week of Game 1 of the Eurocup Finals, Unics Kazan's guard and blogger Nikos Zisis talks about how he and his teammates are getting ready to take on Valencia Basket Club to try to win the title! Unics Kazan overcomes 11-point deficit to advance to Finals! Valencia Basket sweeps semifinals series, makes fourth final! Valencia's Doellman claims Eurocup Finals MVP trophy! Nobody across the 4,000 kilometers between Valencia, Spain and Kazan, Russia had any doubt when the series ended on Wednesday with Valencia Basket Club as champion who exactly had to be the Eurocup Finals MVP. That honor was signed, sealed and delivered in the name of forward Justin Doellman after he led Valencia to a 73-85 victory to sweep the two-game series and win his team's unprecedented third Eurocup title. Doellman needed less than 25 minutes on court Wednesday to turn in another of the best performances in Eurocup Finals history. His 26 points tied for the fourth-most in any final game in the 12-year history of the competition. And his performance index rating of 34 was the fourth-best ever. His 4 steals tied the record for most in a final, too. In both cases, Doellman's own performance in Game 1 ranked slightly ahead of his Game 2 show. His 28 points in Game 1 tied the all-time scoring mark in a finals game and his performance index rating of 35 in the series opener was the third-best ever, behind only a pair of former Valencia stars. Dejan Tomasevic, the MVP of the inaugural Eurocup Finals in 2003, and Nik Caner-Medley in a losing cause in the 2011, both had index ratings of 38. Doellman seemed poised to break both records late in the third quarter Wednesday, when he left the court with 26 points and an index rating of 36. With the game and the series well in hand, he didn't return until late in the fourth quarter, when he missed his only additional shot and committed a couple of fouls. Nonetheless, in just the second Eurocup title to be decided in a two-game series - the first was that inaugural one in 2003 - Doellman shattered the best previous scoring (54 points) and index rating (69) totals. Doellman, 29, was named to the All-Eurocup First Team this season and last, both with Valencia. The Eurocup trophy is the first international title of his seven-year professional career. He spent his first three pro seasons in France with three different teams, and has since played for three others in Spain, joining Valencia before the 2012-13 campaign. "I have to thank my coach and teammates for putting me in the right position to do well, but the most important thing is that we won a championship tonight and we will celebrate together," Doellman said. "Andrew Goudelock is a great player, but Sam Van Rossom and Oliver Lafayette played great defense against him and our teammates as well, we helped each other out and tried to slow him down. We were not nervous; we were very comfortable and came here with the mentality to win. We tried to impose our rhythm on defense, played very well tonight and that's the most important thing. We were able to get a championship."